At Pediatric Dentistry of Prospect, Dr. Danielle and the rest of our team always takes the time to create a safe and compassionate environment where our patients can feel right at home. However, we understand that sometimes, this isn’t enough to help children overcome their feelings of anxiety, fear, or over excitement. With sedation dentistry, your son or daughter can be relaxed safely and comfortably so that they’re able to receive the dental care their growing smile needs to thrive. We offer nitrous oxide, oral conscious sedation, and general anesthesia in a hospital setting. If your child is unable to sit still and hold their mouth open for a significant period of time. If your child is in need of a lengthy procedure and/or multiple procedures. 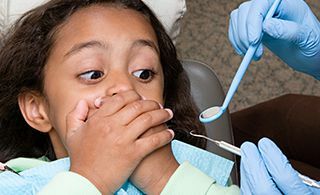 If your child has a sensitive gag reflex or is unable to properly become numb through local anesthesia. If the patient is a child or adult with special needs. Our Prospect, KY office can’t wait to welcome your loved one. Contact us today to schedule your first appointment, or if you have any questions our team can help you with.